Land is the most prized of human possessions, providing us food, resources and a “solid footing”-quite literally-as well as a sense of identity and belonging. In modern democracies, it is also the battleground between people’s right over it on the one hand and the notion of the “greatest good of the greatest number” on the other hand. The doctrine of eminent domain has been employed by governments to acquire private land for public purposes all over the world as well as in India. Land was acquired in India under the colonial era Land Acquisition Act, 1894 for more than a hundred years. 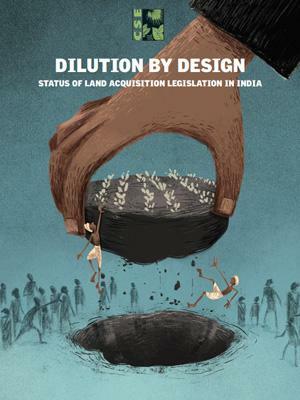 Its gross inadequacies and archaisms were sought to be addressed by a new Right to Fair Compensation and Transparency in Land Acquisition, Rehabilitation and Resettlement (RFCTLARR) Act in 2013. The new Act had shortcomings, but was a step in the right direction. However, the Central government and many state governments have been circumventing and weakening the application of this Act through various legal means at their disposal. What is the rationale for such strategies? How far have they been successful? What does the future hold? Is there a possibility of a better land acquisition regime in India? This report delves deep into these questions.